Guests can choose to dine at one of the two restaurants on site. The Clippers Cafe Bar serves light lunches and the Seven Palms restaurants offers a buffet. The main attraction for many guests is the beach. This Durban beach hotel is right across the road from the main swimming beach. Tropicana Hotel is within walking distance of a number of shops and restaurants. 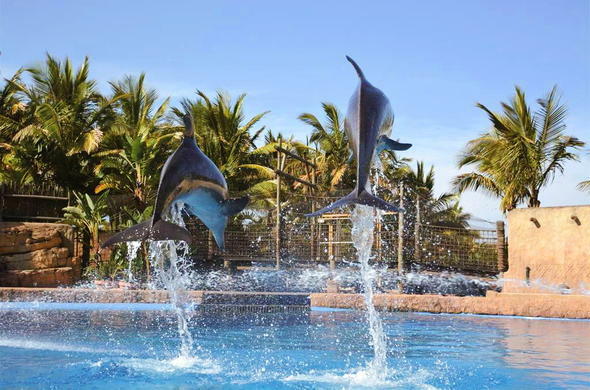 Other Durban attractions nearby include the Suncoast Casino, uShaka Marine World, Gateway Shopping centre and Durban Botanical Gardens. This Durban beach hotel offers five fully-equipped conference/function venues. The largest venue can accommodate up to 300 delegates. Tropicana Hotel also has a business lounge available with computer, printing and Internet access.